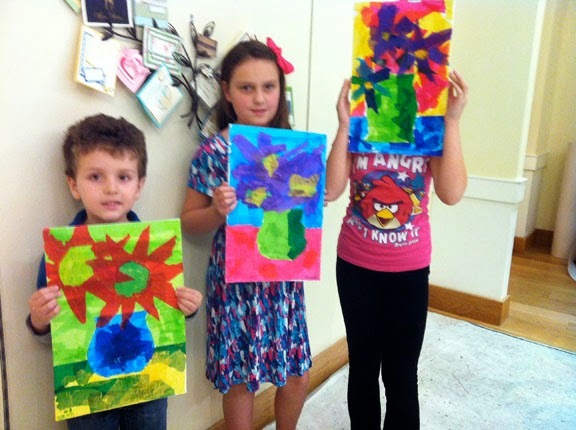 To sign up for any or all of these great summer classes for kids ages 7-11, contact the gallery at (321) 504-4343. All classes require pre-registration with payment in full. A minimum of 4 students is needed for each session. For more information or questions, contact the individual instructor (contact information for each instructor is at the bottom) or Susan Stone at susan@jsusancolestone.com or (401) 596-4266. All classes are 10 am to noon on the date noted. Tuesday, July 1, 2014 - Super Heroes with Mimi Givens – Drawing on canvas using black, Sharpie marker outline and acrylic paintings of our favorite game or super-hero characters. This class will invite children to consider their favorite super heroes, and to draw them first, then outline in marker, then, paint them in classic comic-book style. Techniques such as mixing colors and drawing will be taught. $20 plus $5 materials fee. 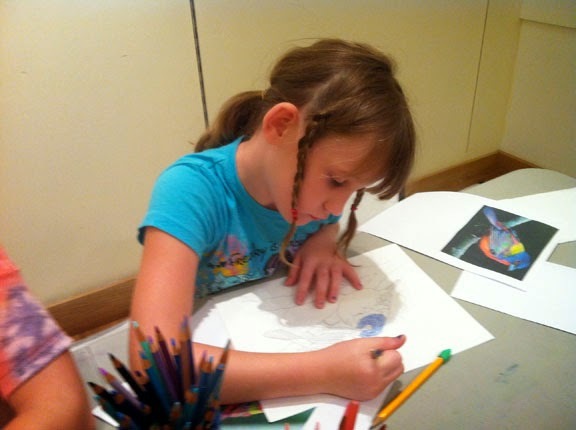 Wednesday, July 2, 2014 - Nature and Mosaic with Mimi Givens– Drawing on canvas using pencil, our favorite natural element, such as a flower, a beach scene, or a sunrise. This class will invite children to consider their composition, and to embellish the finished acrylic painting with mosaic-style pieces glued on of felt paper. Techniques such as drawing, planning the composition, mixing colors, and drawing and gluing will be taught. $20 plus $5 materials fee. Thursday, July 3, 2014 - Nature and Mosaic – The Beach with Mimi Givens– These beach scenes will utilize real things from the beach – sea shells, sand, colored sand, glitter, small dried weeds and flowers. Drawing on canvas using pencil, we will then do an acrylic painting, dry it, and glue on natural elements. This class will invite children to consider their composition, and to embellish the finished acrylic painting with natural treasurers they found on the beach, or from my collection. Techniques such as drawing, planning the composition, mixing colors, and drawing and gluing will be taught. $20 plus $5 materials fee. Tuedsay, July 8, 2014. Painting alá the Masters - Introduction to Georgia O’Keefe with Susan Stone. Using tissue paper and paint, students will create a floral image in the tradition of Georgia O’Keefe. $20 plus $5 materials fee. Wednesday, July 9, 2014. Painting alá the Masters - Introduction to Henri Matisse with Susan Stone. Using cut papers kids will play with the elements of shape, color and design using the principles of balance, movement and contrast. $20 plus $5 materials fee. Thursday, July 10, 2014, Painting alá the Masters - Introduction to David Hockney with Susan Stone. Using imagination, art pens and color, kids will create a landscape in the tradition of British Artist David Hockney. $20 plus $5 materials fee. Friday, July 11, 2014, Painting alá the Masters - Introduction to Henri Rousseau. With Susan Stone. Students will create a jungle scene using acrylic paint and pastels in the unique style of Henri Rousseau. $20 plus $5 materials fee. Wednesday, July 16, 2014 Colored Pencil Drawing Techniques – with Maria Laughlin This class will introduce children to basic art using color pencils with different techniques such as mixing colors and outline finish. $20 per class plus $5 materials fee. Wednesday, July 23, 2014 Colored Pencil Drawing Techniques - with Maria Laughlin - this class will introduce children to basic art using colored pencils and they will learn how to blend. Images will be pre-drawn and mounted on boards. $20 per class plus $5 materials fee. Wednesday, July 30, 2014. Colored Pencil Drawing Techniques Mixed Media with Maria Laughlin -This class will introduce children to basic art using mix media figurative art with color pencils and charcoal. Images will be pre-drawn and mounted on boards. $20 per class plus $5 materials fee. Wednesday, August 13, 2014 Colored Pencil Drawing Techniques - with Maria Laughlin – this class will introduce children to basic art using color pencils with techniques such as color pressure and layering colors.$20 per class plus $ materials fee.